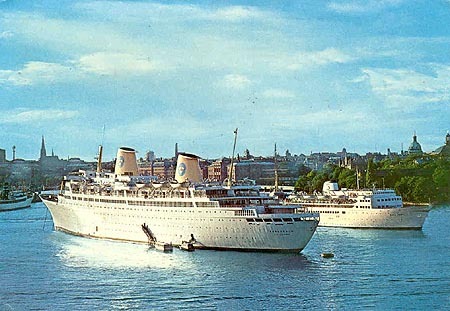 This page is devoted to postcards and photographs of the Swedish America liner Kungsholm (4), which became the Sea Princess and Victoria in the Princess and P&O fleets. 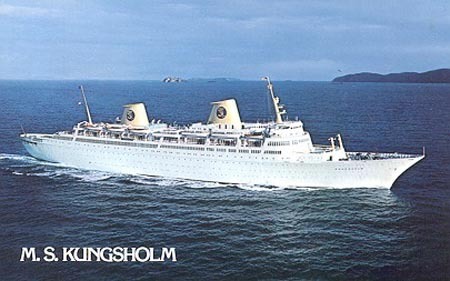 Kungsholm (4) was built by John Brown, Clydebank in 1966, and entered service with Swedish America. 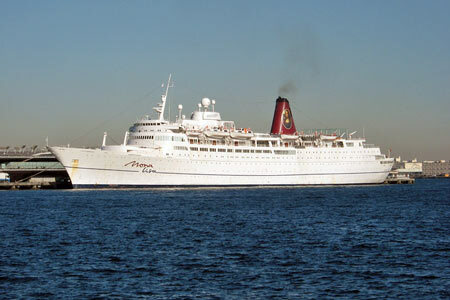 She was sold to Flagship Cruises in 1975, retaining her name. 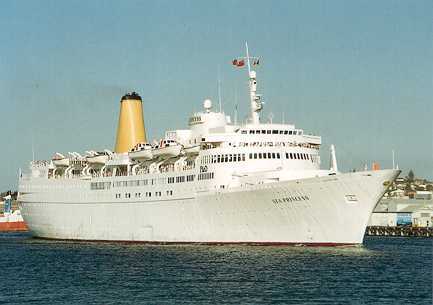 The Kungsholm (4) was then bought by P&O in 1979 to replace the aging Arcadia. She was given a major overhaul in Bremen, which ruined her classic liner appearance, and renamed Sea Princess. 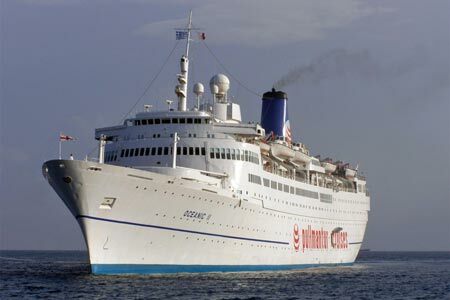 Initially operated by P&O Cruises in the Australian, then British markets, she was later transferred to the US market and appeared in Princess Cruises colours. 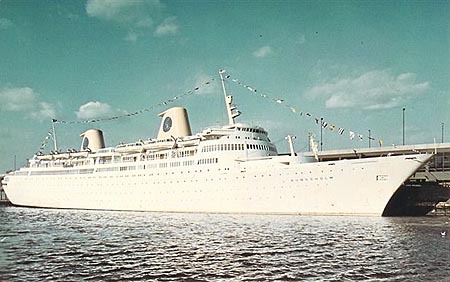 She eventually returned to P&O Cruises, and has subsequently been renamed Victoria. 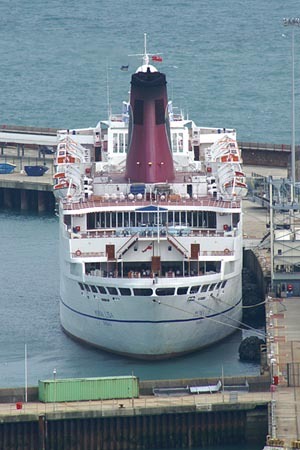 In Winter 1999/2000 Victoria operated a cruise on charter to the Union-Castle Line, and received a red/black funnel. 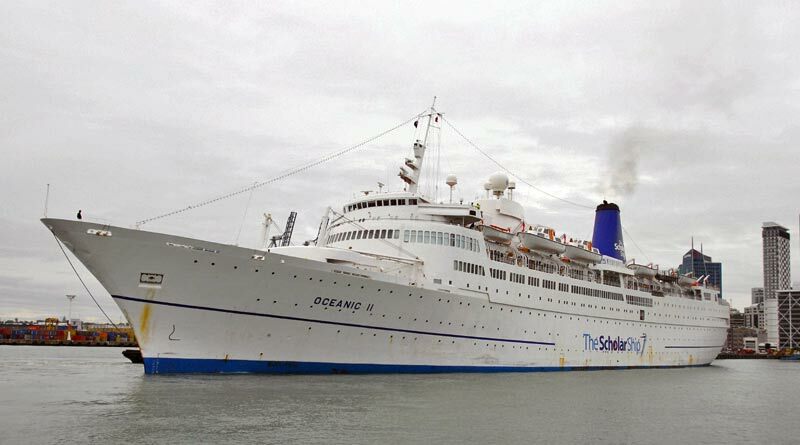 It was announced in February 2001 that Victoria would be withdrawn and replaced in the P&O Cruises fleet from November 2002 with the Princess Cruises ship Ocean Princess, which would be renamed Oceana from November 2002. 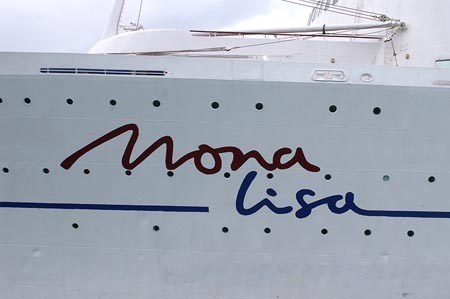 Victoria was sold to Leonardo Shipping, who chartered her to Holiday Kreuzfahrten as Mona Lisa. 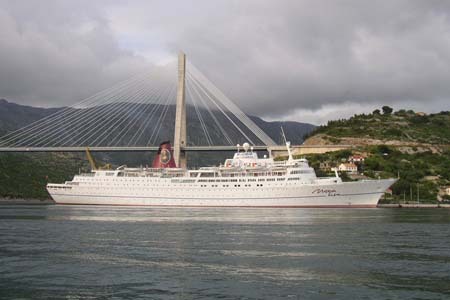 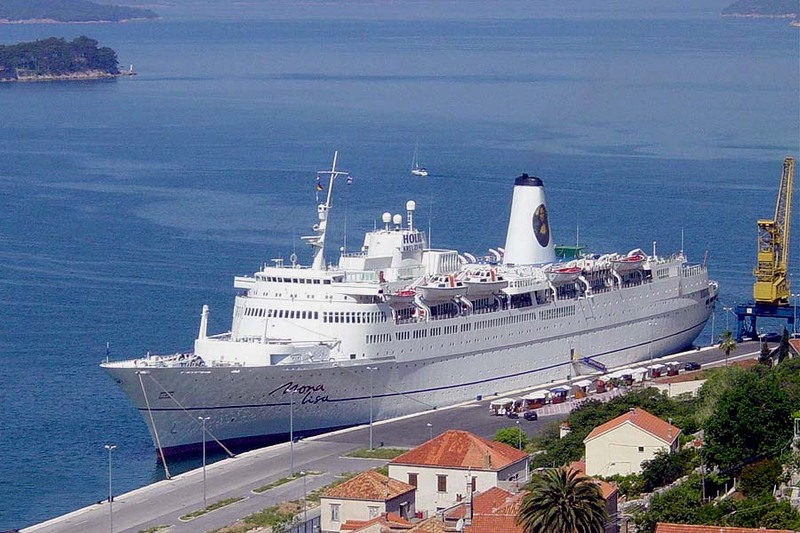 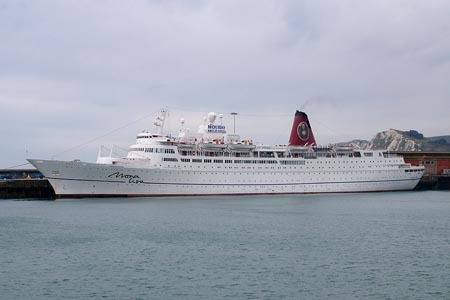 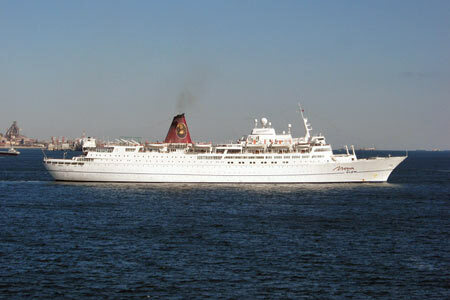 Holiday Kreuzfahrten failed in 2006, and she was used as an accommodation ship for the Asian Games in Doha. 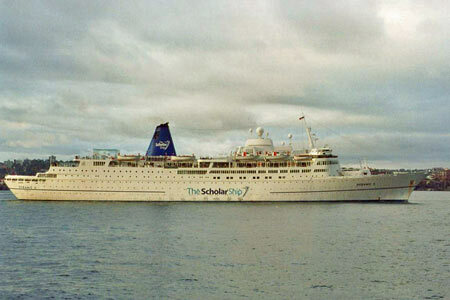 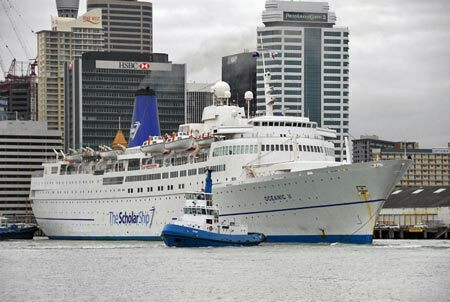 The owners then secured two 8-month charters in 2007/2008 with the Royal Caribbean-backed The Scholar Ship (www.thescholarship.com) for use as a floating student study ship. 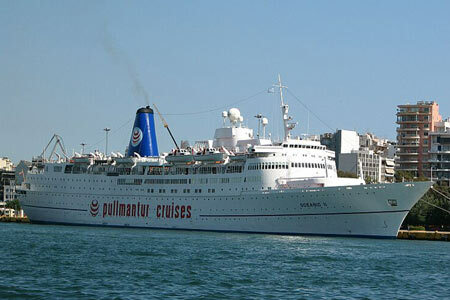 Not surprisingly in view of the Royal Caribbean connection, a summer charter with Pullmantur was also arranged for 2007. 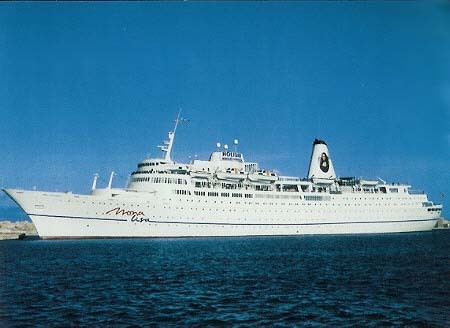 Mona Lisa was renamed Oceanic II. 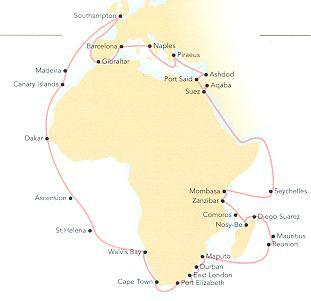 She also had a brief charter with Louis Cruise Lines to replace the lost Sea Diamond, before moving to Pullmantur. 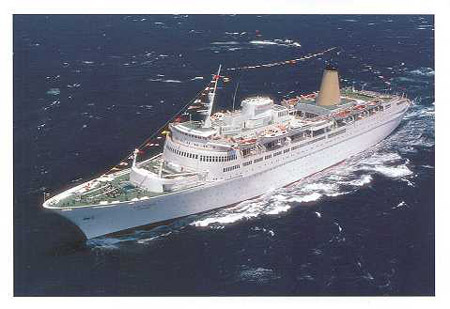 Kungsholm (4) was built by John Brown, Clydebank in 1966. 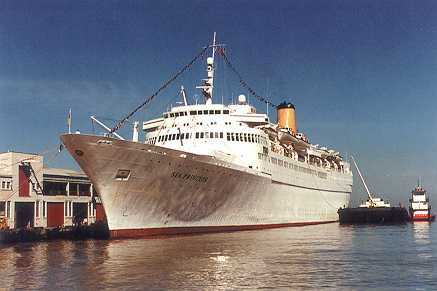 She was sold to Flagship Cruises in 1975, retaining her name. 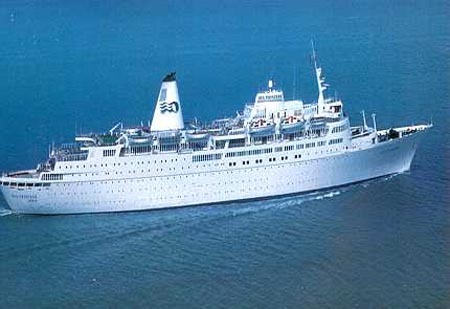 She was sold again to P&O in 1978, becoming the Sea Princess. 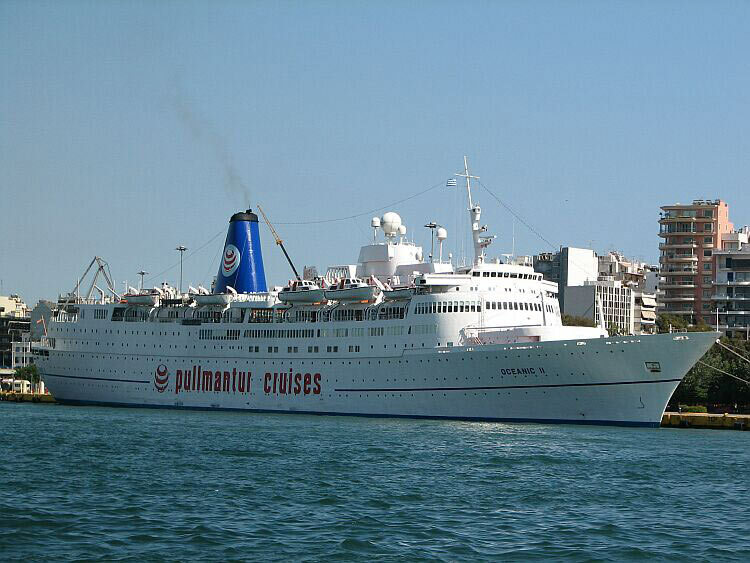 She has operated successively in the P&O Cruises, Princess Cruises and again the P&O Cruises fleets. More recently, she was been renamed Victoria. Mike Roberts card FF-130 of Kungsholm in the Miraflores Locks, Panama Canal. 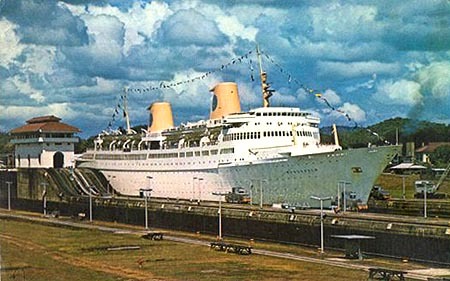 This card was posted to the UK from the Canal Zone on 25/4/1975. 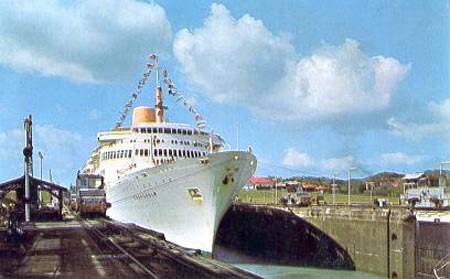 Postcard of Kungsholm in the Miraflores Locks, Panama Canal. 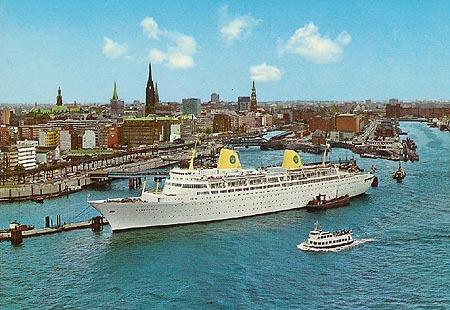 Lindenhags (Gothenburg) card 2/104 of Kungsholm in Gothenburg harbour. 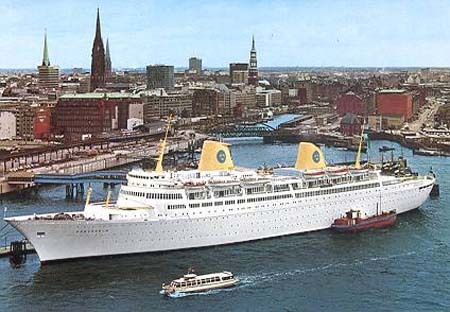 Note that one of the earlier Swedish America sisters is in the floating dock behind, and the bow of a Sessan Line ferry is visible to the right. 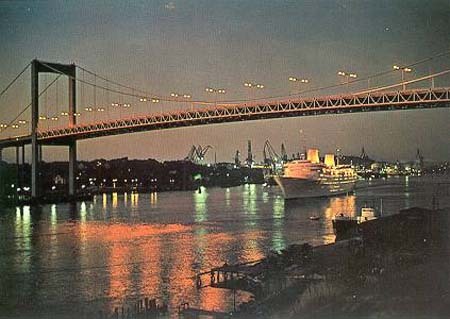 Lindenhags (Gothenburg) card 184 of Kungsholm in Gothenburg harbour, passing beneath the Alvsborgs Bridge. 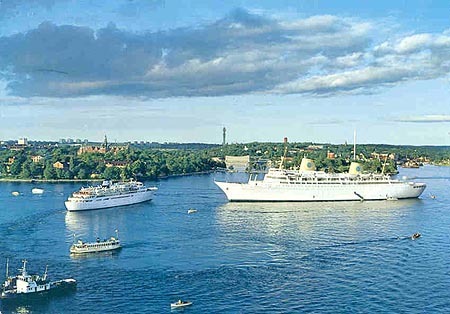 Scankort AB postcard A-100 of Kungsholm (4) in Stockholm. 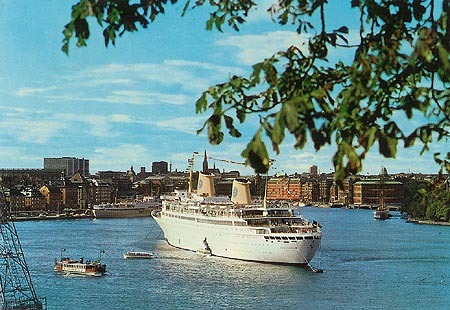 Postcard of Kungsholm (4) in Stockholm. 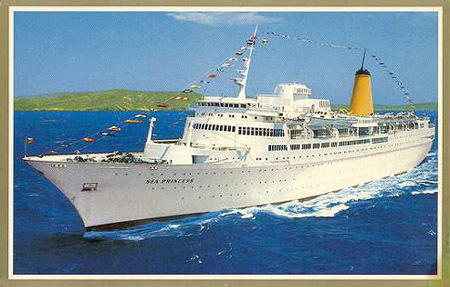 Card supplied by Reto Raeth. 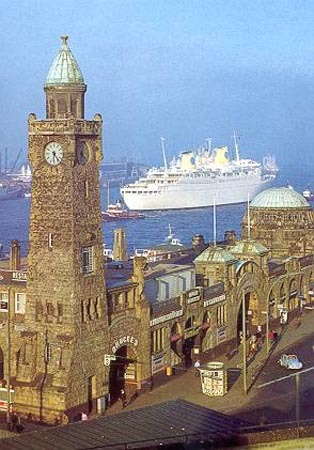 Kruger postcard 920.544 of Kungsholm in Hamburg harbour. 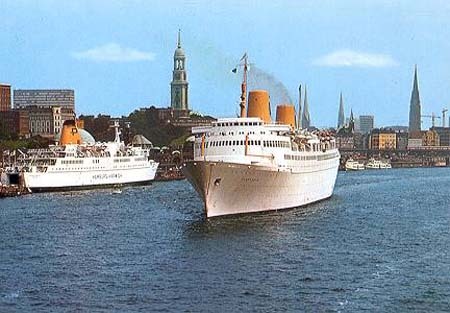 Postcard of Kungsholm in Hamburg harbour. 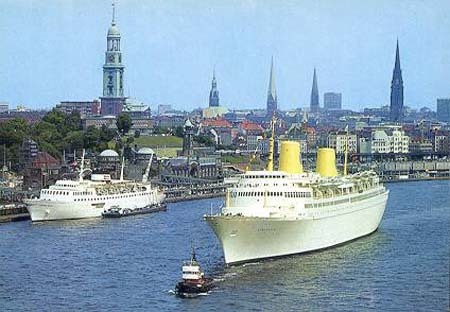 Lübeck Line Regina Maris at the left. 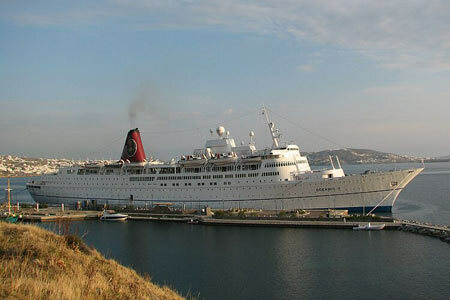 This ship was later operated by Peter Deilmann, until sold for use as a private yacht. 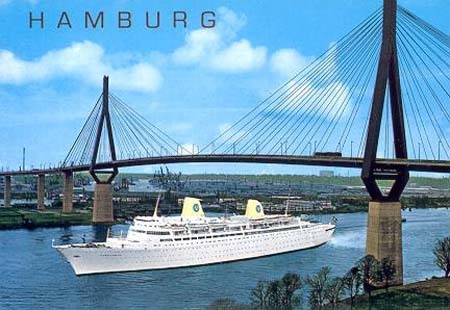 Kruger postcard 920.391 of Kungsholm in Hamburg harbour, passing under the Koehlbrand Bruecke. 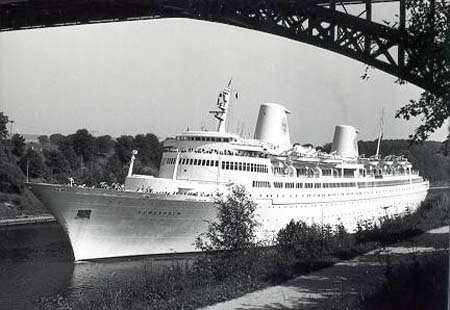 Marina-Fotograf Renard postcard of Kungsholm in the Nord-Ostsee Kanal (Kiel Canal). 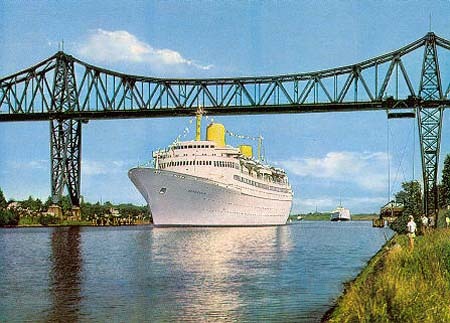 S+S postcard Rd379 of Kungsholm in the Nord-Ostsee Kanal (Kiel Canal) at Rendsburg. 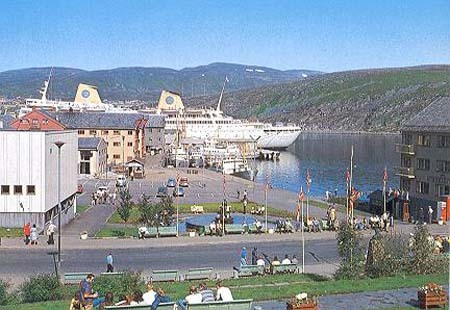 Aune postcard F-6210-7 of Kungsholm at Hammerfest. 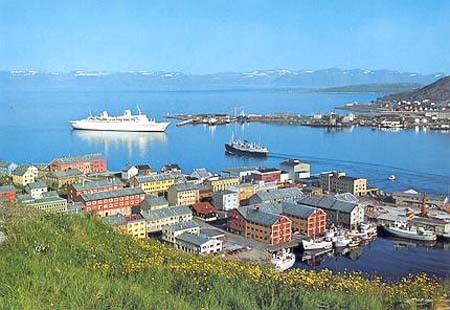 Aune postcard F-7437-4 of Kungsholm at Hammerfest. Flagship Cruises postcard of Kungsholm. 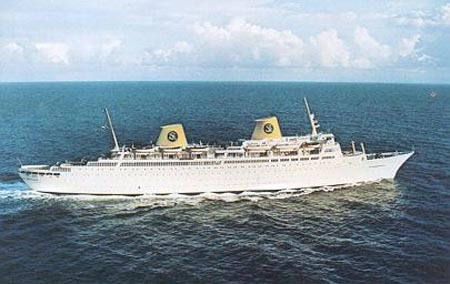 A Flagship Cruises postcard of Kungsholm. 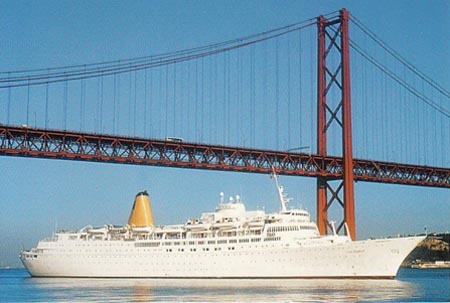 The Kungsholm (4) was bought by P&O in 1979 to replace the aging Arcadia. 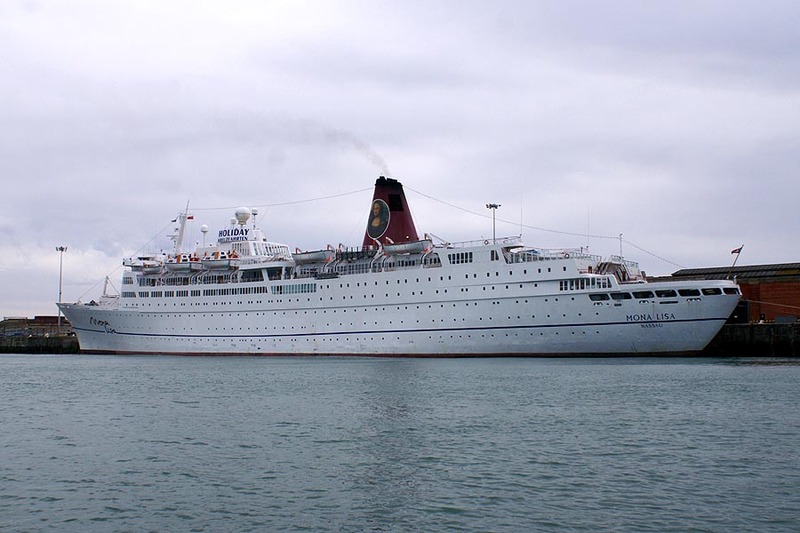 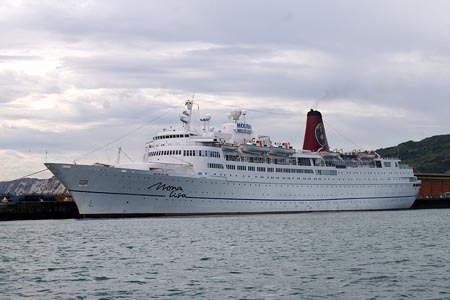 She was given a major overhaul in Bremen, which ruined her classic liner appearance. 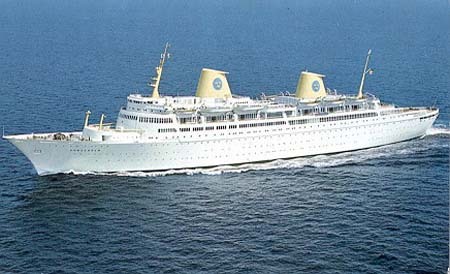 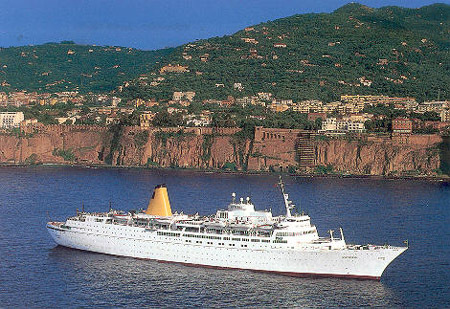 Initially Operated by P&O Cruises in the Australian, then British markets, she was later transferred to the US market and appeared in Princess colours. 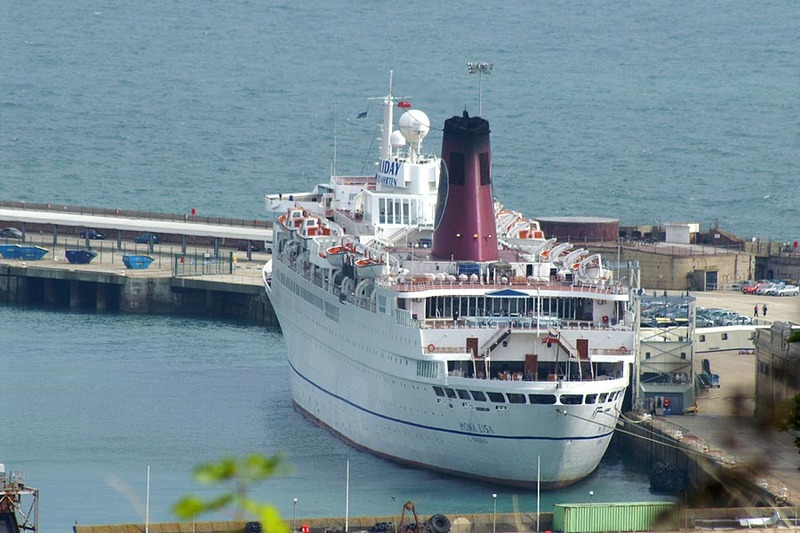 She eventually returned to P&O, and has subsequently been renamed Victoria. 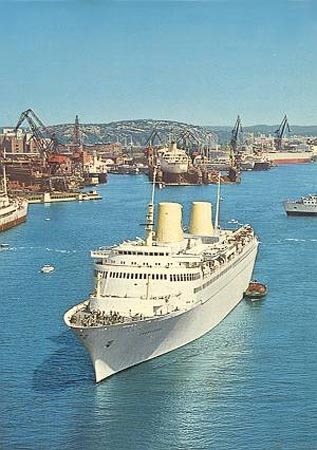 A strange Sea Princess card to release, with distorted proportions. 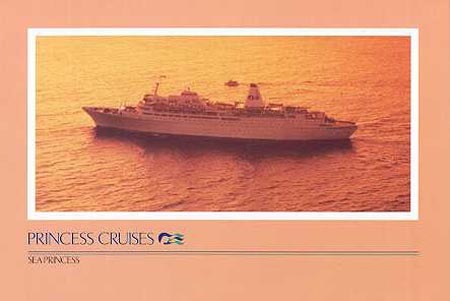 A later Sea Princess card after returning to P&O colours. 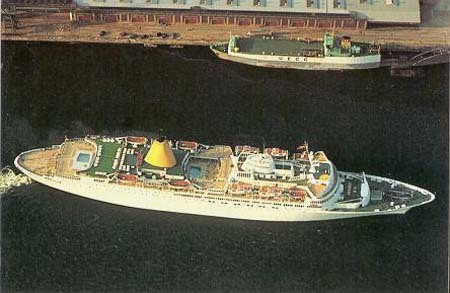 Art Publishers (Durban) postcard of Sea Princess at Durban. 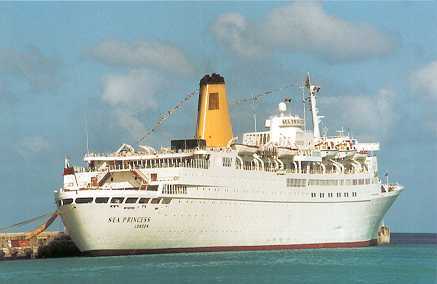 John Stranger postcard of Sea Princess at Southampton. 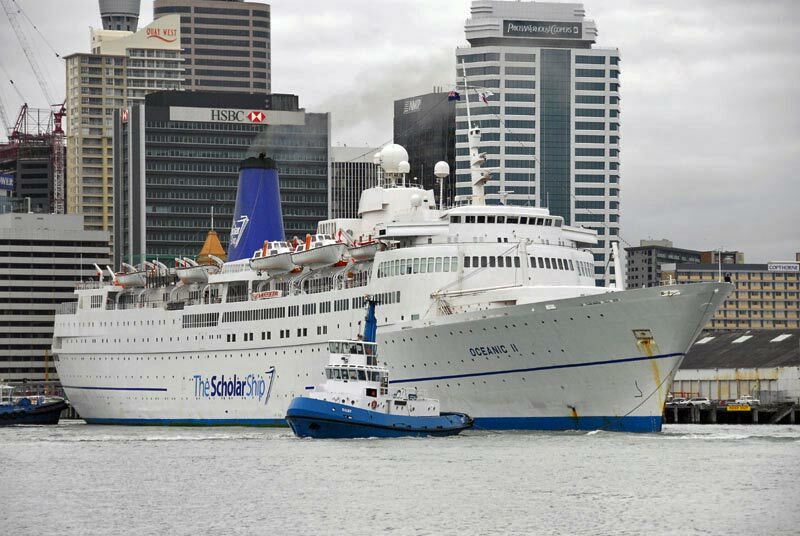 Photo by Mike Insall. 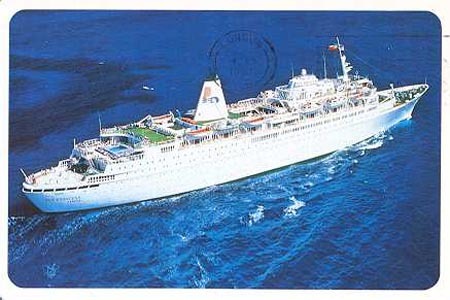 Simplon Postcards release sc2028, issued April 1993, of Sea Princess at Barbados. 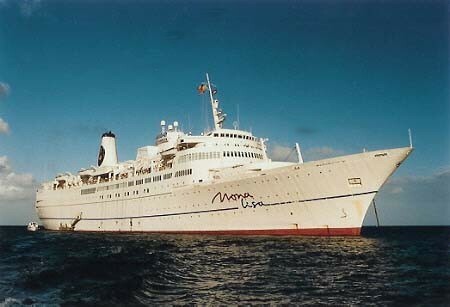 Photo by Clive Harvey, 30/12/92. 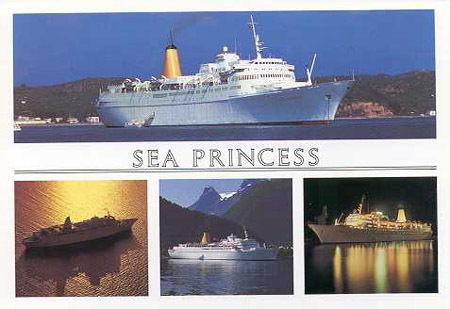 Simplon Postcards release sc2139, issued June 1999, of Sea Princess. 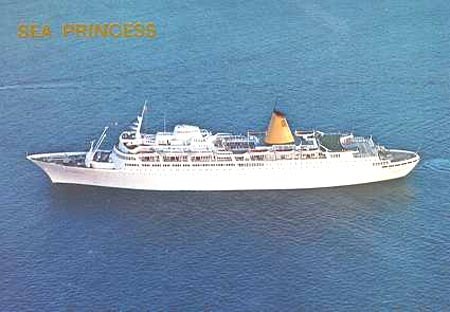 Simplon Postcards release sc2070, issued May 1995, of Sea Princess. 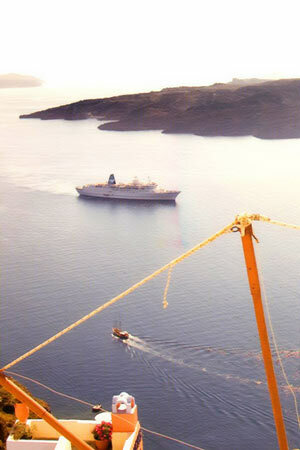 Photo by Marvin Jensen at San Francisco, 15th March 1995. 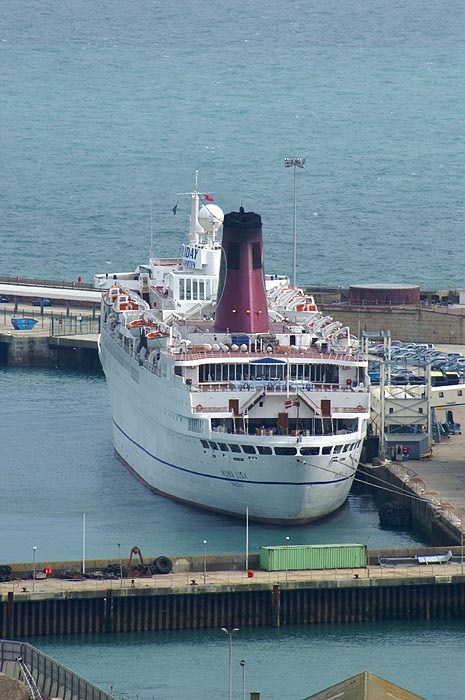 In Winter 1999/2000 Victoria operated a cruise on charter to the Union-Castle Line, and received a red/black funnel. 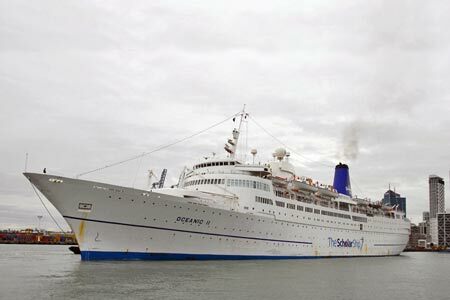 It was announced in February 2001 that Victoria would be withdrawn and replaced in the P&O Cruises fleet with the Princess Cruises ship Ocean Princess, which would be renamed Oceana from November 2002. 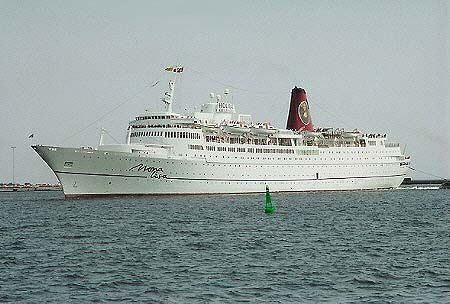 In practice it was Adonia which more accurately replaced Victoria, since she was a child-free ship. 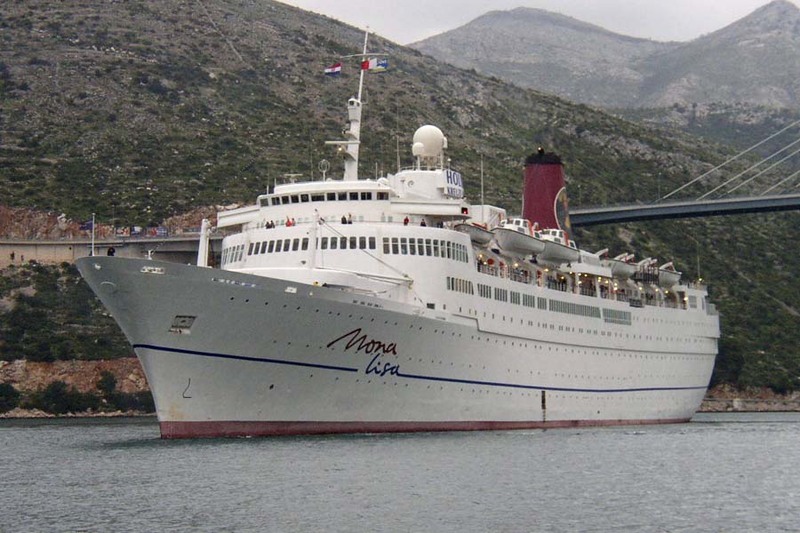 Victoria was sold to Holiday Kreuzfahten and renamed Mona Lisa. 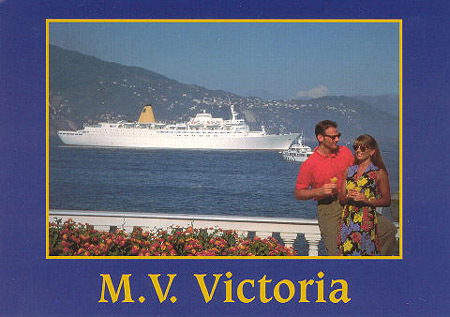 A postcard as renamed Victoria - one of the short-lived series of cards with blue borders issued in 2000. 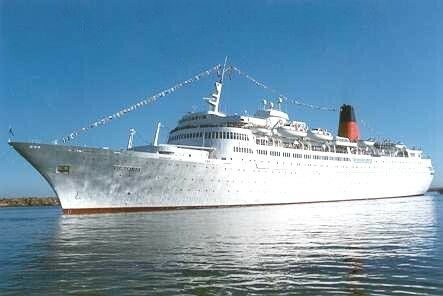 A later card as renamed Victoria. 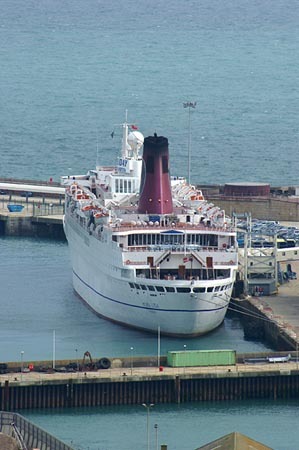 The card of Victoria available on board in 2002, her final season. In Winter 1999/2000 Victoria operated a single cruise on charter to the Union-Castle Line, and received a red/black funnel. 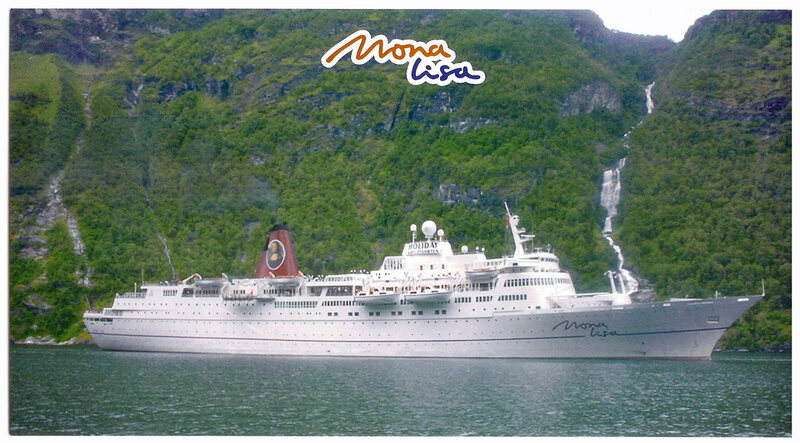 This official card was issued. 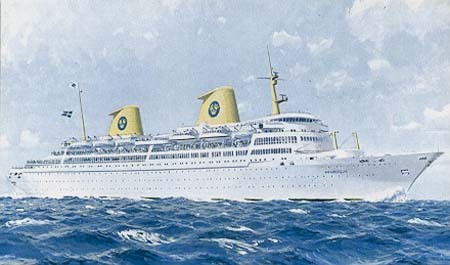 The card back showed a colour map of the cruise, which is shown below. 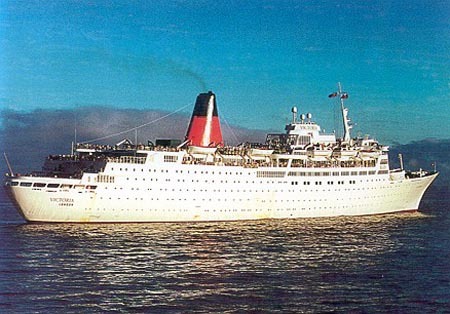 A card was also issued of the rebuilt Merchant Navy class steam locomotive which pulled the special boat train for passengers travelling from London to Southampton to join the cruise. 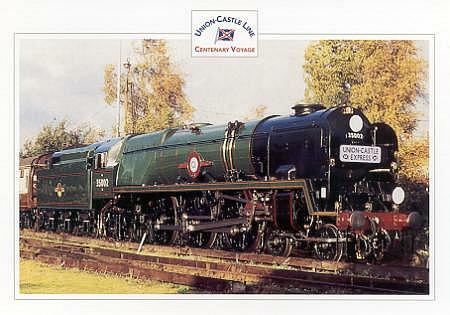 The locomotive is actually 35028 Clan Line, but it was temporarily fitted with plates to portray 35002 Union Castle Line for the occasion. 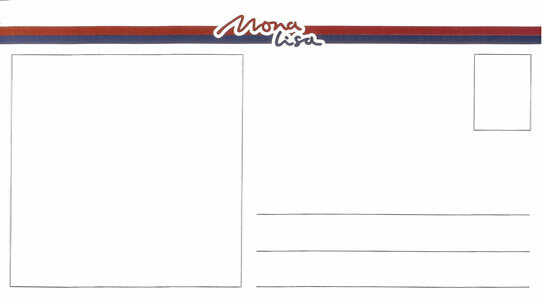 The name plate was shown in colour on the card back, and is also reproduced below. I plan to create a web page devoted to this interesting class of steam locomotive in the near future. 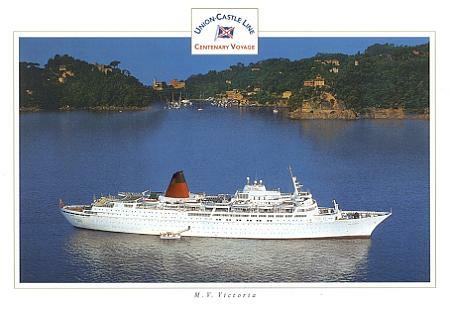 This card of Victoria in Union Castle colours was issued by Simplon Postcards. 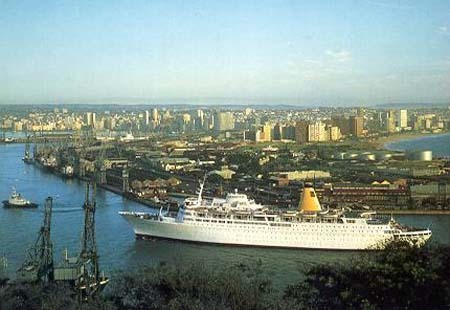 It uses a photograph taken at Capetown by Errol Cornish. 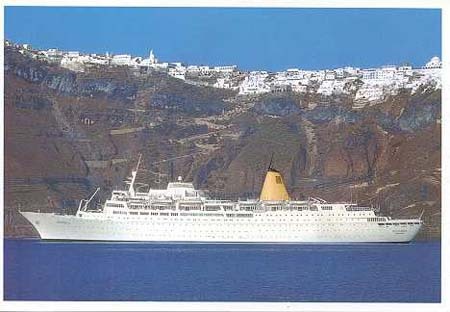 This card was issued by the photographer, Rui Manuel Gouveia Sa, showing Victoria at Madeira. 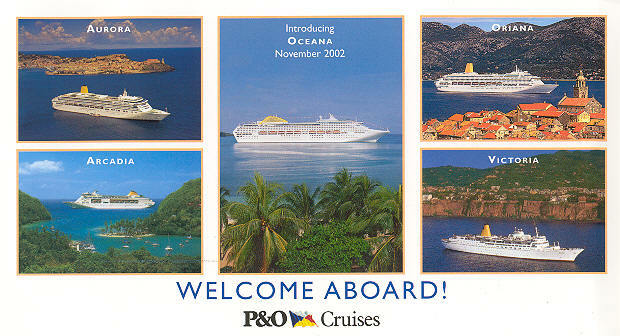 A POSH Club 'Welcome Aboard' card of the 1999 P&O Cruises fleet, supplied to members who take a cruise (the POSH Club is P&O's frequent travellers club). 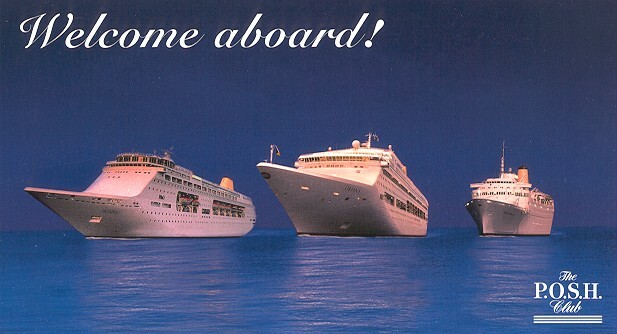 A POSH Club 'Welcome Aboard' card of the 2000 P&O Cruises fleet, supplied to members who take a cruise. 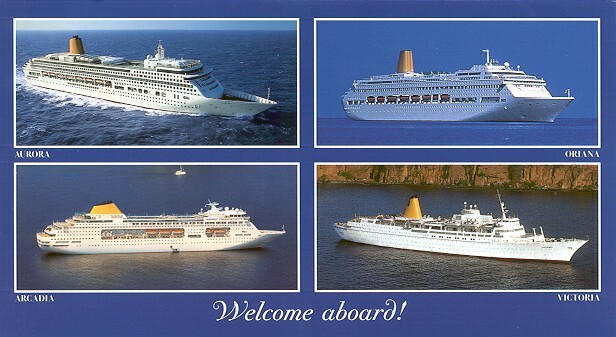 A POSH Club 'Welcome Aboard' card of the 2002 P&O Cruises fleet, showing both Victoria and Oceana, which will not be in the fleet simultaneously. 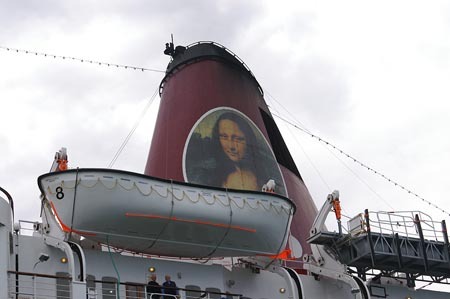 Victoria was sold to Leonardo Shipping, who chartered her to Holiday Kreuzfahrten as Mona Lisa. 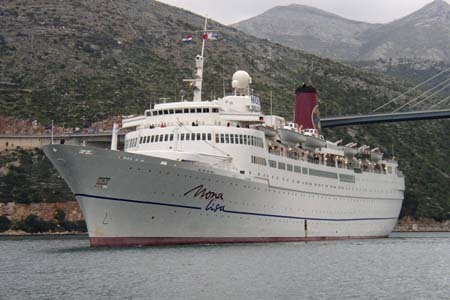 After use as Oceanic II and The Scholar Ship, she was chartered to as Mona Lisa, and was due to take a German charter in summer 2009. Victoria was sold to Leonardo Shipping, who chartered her to Holiday Kreuzfahrten as Mona Lisa. 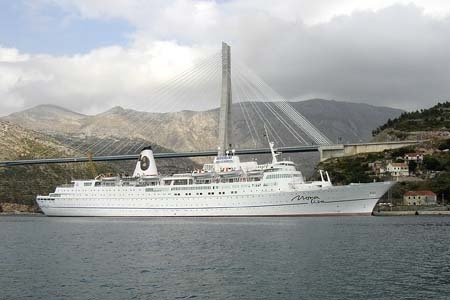 Holiday Kreuzfahrten failed in 2006, and she was used as an accommodation ship for the Asian Games in Doha. The owners then secured two 8-month charters in 2007/2008 with the Royal Caribbean-backed The Scholar Ship (www.thescholarship.com) for use as a floating student study ship. 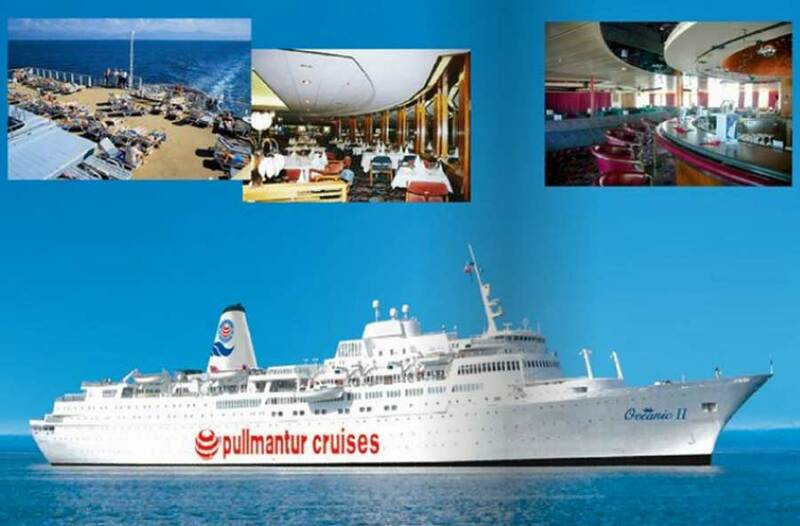 Not surprisingly in view of the Royal Caribbean connection, a summer charter with Pullmantur was also arranged for 2007. 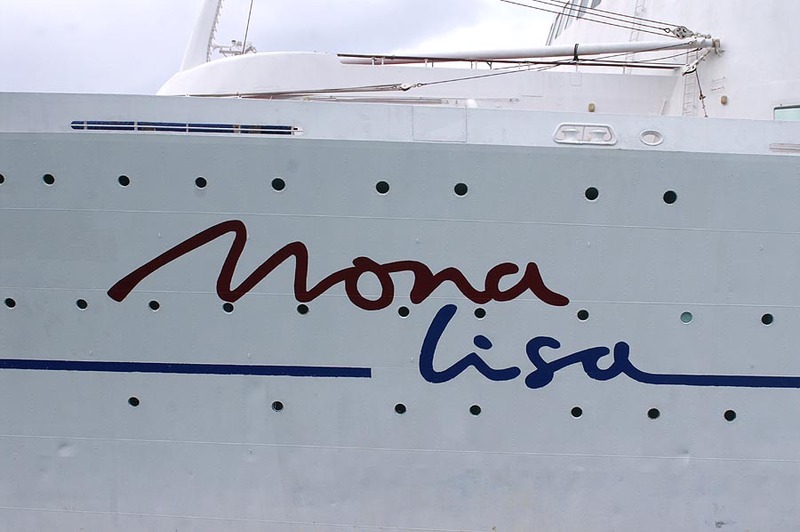 Mona Lisa was renamed Oceanic II. 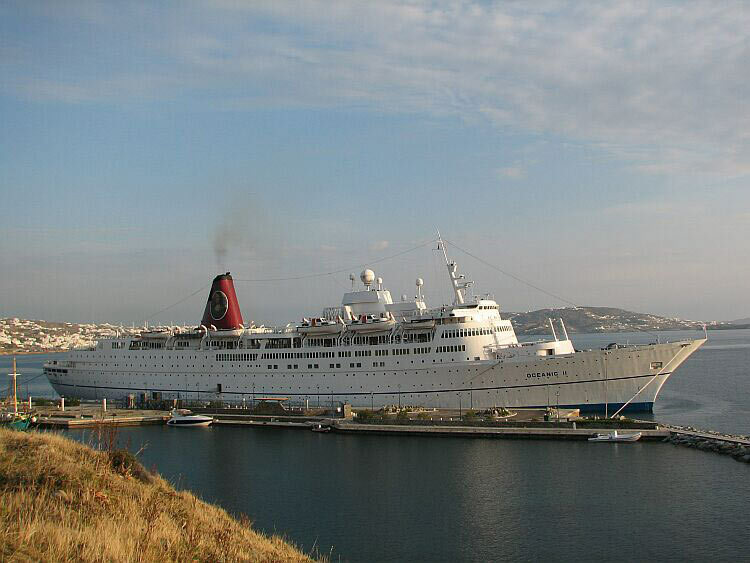 She also had a brief charter with Louis Cruise Lines to replace the lost Sea Diamond, before moving to Pullmantur. 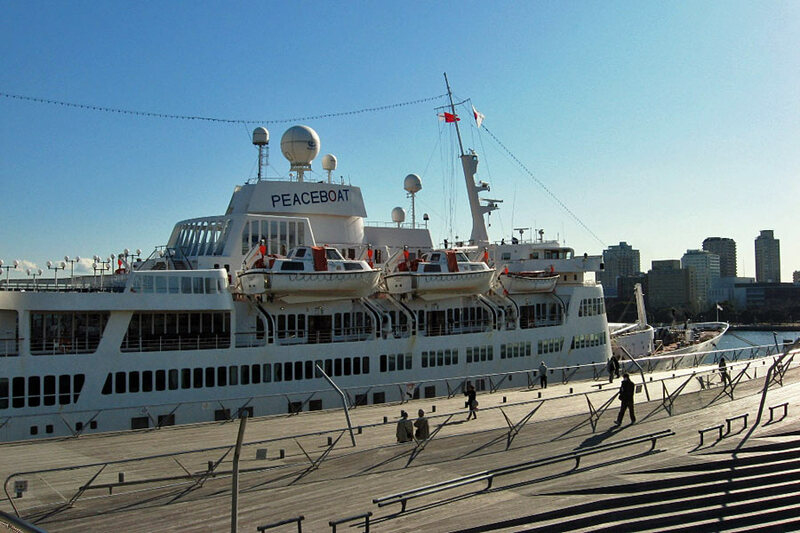 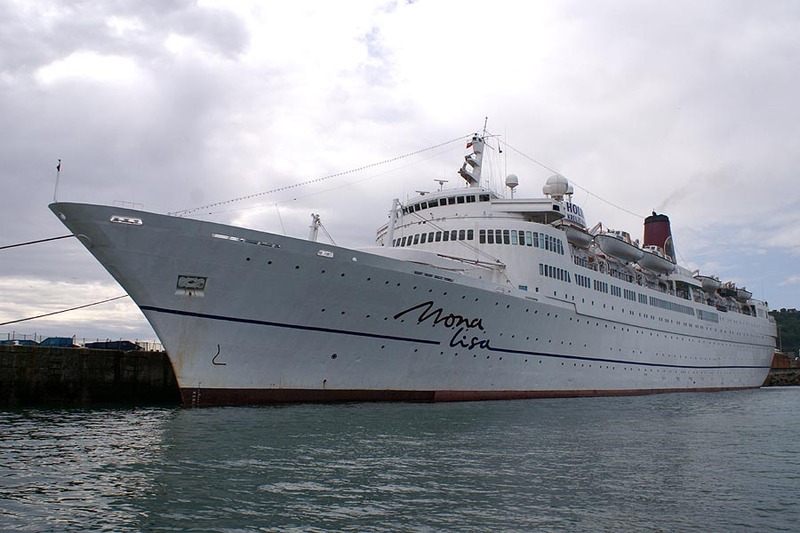 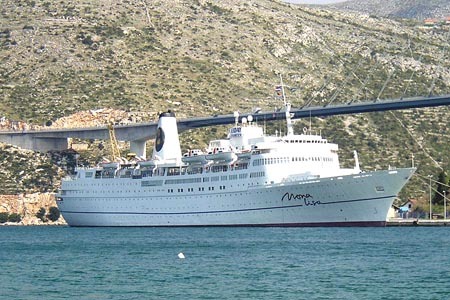 After use as Oceanic II and The Scholar Ship, Mona Lisa was chartered Peaceboat, and was due to take a German charter in summer 2009.